"Electric Paint: The Computer as 21st Century Canvas"
Forget magic carpets. Today it takes only a simple mouse click to be carried away to new worlds of adventure and learning. The revolution spawned by the triple play of the computer, software, and the internet affects every aspect of contemporary life and allows people around the globe to share ideas, images, and sounds almost instantaneously. A new breed of artists has embraced these cutting-edge technologies and is using them to maximum advantage to exploit and explore the visual possibilities of cyberspace. Yet despite the creative artistic storm taking place on the internet, the work of these pioneering cyber-artists remains virtually unknown to many. "Electric Paint: The Computer as 21st Century Canvas," an exhibition organized by Woodson Art Museum curator Andrew McGivern, brings together 70 works by 22 international artists to shed light on the phenomenon of computer-generated art found on web pages, galleries, and virtual museums worldwide. The exhibition opens April 15 and continues through June 18, 2006. A digital artist's tools and studio look nothing like the artist's studio of old with its brushes, palettes, canvases, paper, paint tubes, and easels scattered about. Instead, digital artists work with myriad software programs to sketch and paint images on their computer screen or introduce digital photographs into their work, using electrons to bend, cut, paste, and fold images. Another technique involves using mathematical formulas to create fractals. In nature, a fractal is a complex, detailed geometric pattern repeated at ever-decreasing sizes. By changing the formula the artist creates an entirely new artwork. Artists selected for "Electric Paint" hail from Austria, Belgium, Brazil, France, Germany, Israel, Italy, Poland, Russia, Sweden, Turkey, Wales, and the United States. 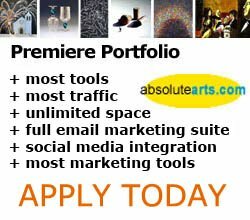 This wide-ranging geographic and cultural array ensures diversity in style, subject matter, and technique yet also reveals the internationality of the passion and knowledge - both artistic and technological - that digital artists bring to this burgeoning art movement that is rapidly changing the landscape of contemporary art. Among the artists represented is Gun Legler of Sweden who manipulates photographs to create portraits infused with layers of colored texture that alter the image's mood to evoke a sense of contemplation and melancholy. Maxim Shoshief of Russia toys with perceptions of reality by depicting a multistoried brownstone rising from the sea into a watery sky where it exists eerily in a world between two bodies of water. A short video clip created by Ariel Severino, who works in Sao Paulo, Brazil, blends tribal music with images of artifacts - some scanned in, others drawn on an electronic sketchpad - from a 1950s study of an Amazonian aboriginal tribe. The combination of elements reflects the video's title, "Moto Perpetuo" ("Perpetual Motion"). Though computer-generated art is an art movement in its infancy, the works selected for "Electric Paint: The Computer as 21st Century Canvas" exemplify the groundswell of interest created by the ready accessibility of computers, software, and the internet. Like early European settlers who came to America, the artists in "Electric Paint" are explorers in a digital world seeking new trails and new discoveries. As such they have laid the foundation for digital art to become a dominant force in contemporary art. Fiserv Health/Wausau Benefits is the Presenting Sponsor of "Electric Paint" and WFXS-FOX55 is the Media Sponsor.